Montagu says no to drugs! Another stunning Saturday morning in Montagu. 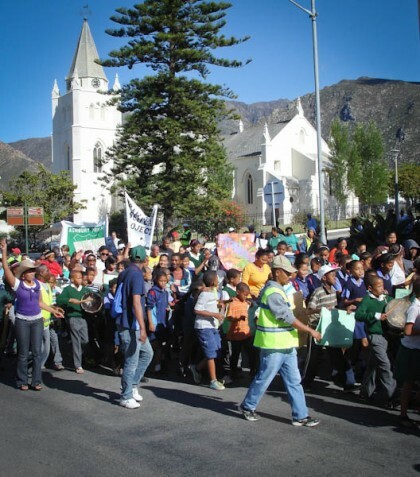 A few hundred people, mostly children, take to the streets of Montagu to participate in a drug awareness march. The banners and the drums send a clear message to the Saturday morning shoppers, "Montagu says NO to drugs!" This initiative is a combined effort between "The Life Centre", the "Sector 2 Community Police Forum" and the local Montagu police. The same groups are also providing more intimate group sessions at each school in Montagu. Graphic slide-shows, guest speakers and dramatic mime performances, ensure the children understand the risk of making that one very important decision in life... "yes or no to drugs?" Guest speaker Lee Gooderson says "You are perfect just the way you are!" You said it Lee, keep spreading the message.